My client a very avid horse lover really wanted a Horse Mural above the crib for her new baby Daughter. 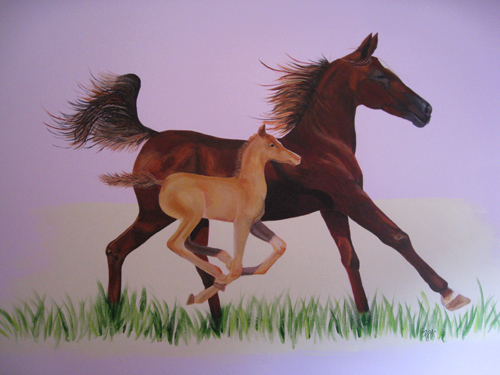 We chose an image of horses running through the grass. 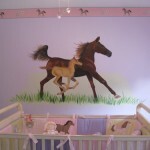 I enjoyed creating this mural as it is something the child can grow with and will love for years to come. 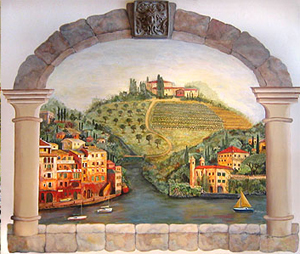 I paint beautiful murals for your office or business so that you, your employees and customers will enjoy their working environment even more. 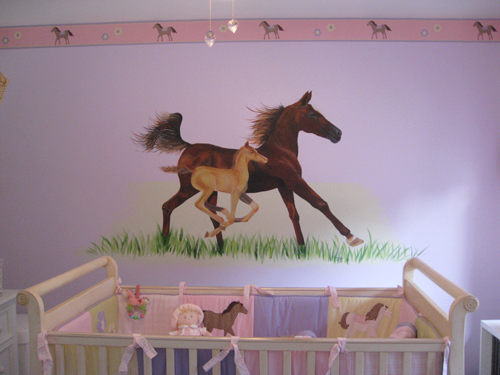 Click the following link to see all COMMERCIAL MURALS. 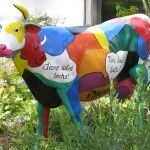 This “Picowso” fiber glass cow was a delightfully moooving experience. This lawn ornament surounded by trees & plants, is painted with special bright, sign paint and clear coated to withstand the elements. She has “Got milk?” written in four languages. Spanish, English, French & Italian. 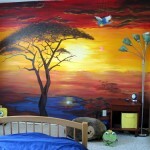 This Mural was created for a boy that will be a teen in a couple of years. So it has a more grown up feel yet appeals to the child now too. 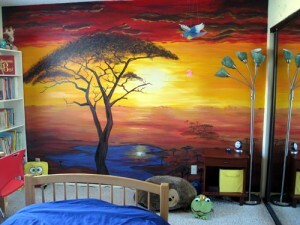 Bright colors and an African tree create a very nice accent wall for the bedroom. 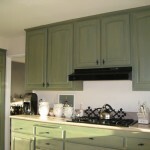 To stave off the cost of remodeling this kitchen, a Faux Finish Paint technique was applied. We chose a semi transparent green color and gave this kitchen a makeover to not only please the eye but the pocketbook too. 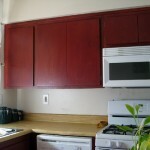 Instead of having the expense of new or refinished cabinets why not just add some fabulous color to give them new life? For this couple, we chose the wife’s favorite color – a nice transparent, rich burgundy. They have had many compliments!